If at first you don’t succeed, try and try again. I’m sure you’ve heard that phrase as you were growing up. It’s good advice, but it’s hard to try and try again. There are many reasons we don’t want to try again: rejection, fear of failure, discouragement, thoughts that everyone else is so much better. I’m sure you could add to the list. In our culture there is so much pressure and competition. Some of this is due to the vast number of choices, the vast amount of information, and the vastness of our globally interconnected world. The pool of competitors and the points of comparison are so much bigger than fifty or one-hundred years ago. The theme here is not “You’ve got to play to win.” That sort of thinking sounds like a slogan for playing the lottery. No, the message here is about courage. And genuine courage, genuine strength cannot come from inside ourselves. All of us encounter dragons in our lives that are bigger than we are. The courage and the power to slay those dragons comes by looking outside ourselves! Fear of man — our fear of others’ expectations or disapproval — causes us to lose courage. The greatest regret expressed by many people on their death bed is that they lived their life according to the expectation of others. And living in that kind of fear can kill our ability to think big thoughts and dream big dreams. Especially for those who know Christ, our Creator dreams big dreams for us. So surround yourself with courage. How? Read the Bible. Be around people that encourage you to be the best you can be. Learn to filter those who bring you down. Courage is contagious. It can be spread from person to person. God encouraged Joshua (Deuteronomy 31:23). The King James Version Dictionary definition of encouragement is something intended “to give courage to; to give or increase confidence of success; to inspire with courage, spirit, or strength of mind; to embolden; to animate; to incite; to inspirit.” David is known for slaying the giant Goliath, but several of his comrades slew bigger giants! You can read about David’s mighty men in 2 Samuel 23:8–39. If you want to kill giants, follow a giant killer. 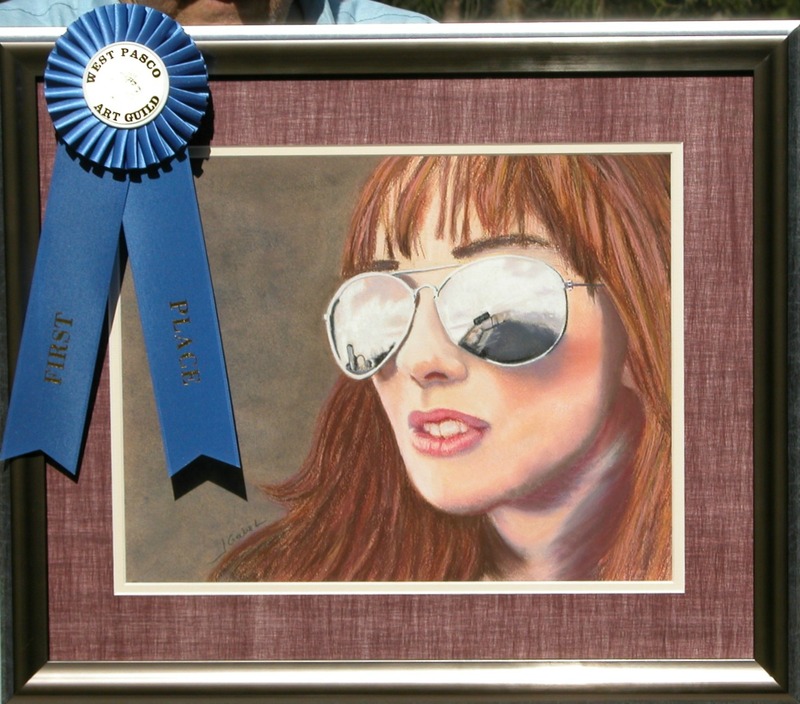 Winning this First Place Award at the Cotee River Seafest was wonderful. Truly, I owe most of this award to my husband, who went to the trouble of taking my paintings to the exhibit to be judged while I was at work. Encouragement has come from so many people: my husband, my sister, my friends whose confidence in me I don’t deserve. So look outside yourself. Are you surrounding yourself with the encouragement of the Lord? Do you have friends who inspire you? Start reading the Bible, and then find a couple of “David friends” who can counsel you, encourage you, and love you through your dreams! First place! That’s just awesome but not surprising. I have a bone to pick with your article. In your last paragraph you say “whose confidence in me I don’t deserve.” Ummm….sorry I beg to disagree. Your work speaks for itself. It is lovely, it is noble, it is true, the colors are pure. I hear a verse in there somewhere. :) Only Satan convinces us that we do not “deserve” – but as an adopted, loved child of God we do — we very much do — deserve. So take those expressions of confidence and as Mary says in the book of Luke “treasure them in your heart” because they are TRUE. The competitive spirit is what makes us strive to improve ourselves, but, alas, has the twin spirit of always comparing ourselves with others. As Shakespeare would say, there’s the rub! No matter how well I did at something, my brother was always better, so I went through my early life thinking I was inferior and my accomplishments meager. I was so out-shined and stood so far in his shadow that I was TRULY shocked to learn, once I went away to college, that I had actually done quite well and accomplished quite a lot! Although my parents always encouraged me, I figured it was just their job to do so. I never really had anyone else except a teacher, here or there to be there for me and be like David’s friends. Now, of course, I know what it is to have that kind of encouragement. I have found this at Laura’s bible study and for this I am eternally grateful! You have given me something that I have only ever gotten from my husband and one other “best” friend in my life! Thank you, Laura, and all the other ladies in the group!